Above: The "Jacobs Lab" at KPBS, San Diego; a prototype innovation news laboratory. "We're Falling Behind and Don't Know Where to Begin!" "The pace of news is speeding up..."
"It seems the world is changing all around us... but we're still doing business like it was yesterday..."
"We know we need to grow our digital muscles but we don't know where to begin..."
Sound familiar? It should be if you are managing a local NPR station today. How to respond to the dizzying nature of technological change is perhaps the greatest challenge facing leaders at local NPR stations. What is our digital strategy? How do we change to meet the changing needs of our community? What does our station bring to the NPR mix? The good news is that these realizations are dawning and prompting exploratory conversations. The bad news is that in most cases, even where added resources are available, the notion of growing new activities that disrupt traditional activities does not come naturally or easily. But confront these challenges we must -- if we are to rise up to our public service commitment and thrive in a time of radical change. Local NPR stations are "the heart of public radio," according to Vivian Schiller, former CEO of NPR. The local stations, she said, are NPR's "secret sauce" because they root the national system in hundreds of communities where personal bonds are forged. These local stations are often the last locally owned and operated major news outlets. Indeed, good things are happening for the NPR system. The non-profit network is growing audiences -- mostly through traditional radio -- serving nearly 40 million Americans every week. NPR and its local stations, however, are not immune from technological disruption. A growing number of radio news users are turning to broadband Internet audio for their "radio" whether it is through a desktop computer or on a mobile phone. The growth of NPR against a backdrop of technological change is welcome news to many media observers. This is because they worry about tremendous losses of journalism jobs at newspapers, deepening the concern for American society. It is an article of faith that a healthy democracy requires a healthy press to inform public decisions and to hold government and other powers accountable. These concerns are worsened by a media rush toward talking-head opinion-based programming, celebrity gossip, and aggregation without origination or verification. Leaders are looking directly to public media -- particularly NPR and NPR member stations -- to shoulder a greater responsibility for "accountability journalism" on the local level. Key to meeting this challenge is the growth and transformation of the relatively small public media sector -- especially the expansion of local newsroom staffing, the improvement of their technical capabilities on-line, and the broadening of their engagement processes with diverse local populations. NPR and its member stations are pressing a shared public service strategy embodied in the report, “Public Radio in the New Network Age,” which asserts the need to be inclusive, to be a trusted provider of local and national journalism, to foster arts and culture, and to advance both the technological and business practices of public media. The implications swirling throughout these studies and plans are that change must happen quickly and scale broadly, while audiences and revenues are still healthy, historically speaking. This poses a daunting challenge. Local NPR stations, in general, have been slow to grow local news operations over the years, albeit there's certainly a swifter effort now -- in part accelerated by the CPB's launch of "Local Journalism Centers," and NPR's launch of "Project Argo" and "The Impact of Government" projects. Dragging down growth efforts has been the running debate in government corridors -- federal and state -- over the viability of continuing public subsidies to public service broadcasting. Meanwhile, at the heart of the journalistic challenge remains the question of how to grow local NPR station capacity. A 2010 census of local public radio journalists reveals that only 15% of NPR stations have news staffs larger than fifteen. Another 40% of NPR stations have news staffs of 5-14. And the largest share of NPR stations, 45%, have fewer than four people whose primary role is local news and public affairs. Above: A quarter of public radio news stations anticipate staff growth this year. Source: PRNDI/MVM Consulting 2010. "Innovation is the path to prosperity," according to Curtis Carlson, President and CEO of SRI International, a non-profit technology consulting agency. He cites society's need to advance the "innovation economy." Because technological change is proceeding rapidly, no one can provide a clear vision for the future of public media. Indeed, the best thinking and consistent counsel is that news organizations (public or otherwise) should experiment. The idea is that innovation and experimentation -- with content, with business models, with story structure, with delivery modes, etc. -- will no doubt produce failures but the more the media "try things," the more likely they will hit upon new successes. Media scholar Clay Shirky writes, "Over time, the collection of new experiments that do work might give us the journalism we need." Moreover, it may be that the right combination of innovations – such as exploiting social networks and harnessing the wisdom of crowds -- will increase public service capacity and outcomes while extending staff productivity (apart from the need to add personnel). Innovation laboratories are familar to the tech sector but new to the established world of broadcasters. Yet, even the broadcast industry -- feeling the competition from cable and broadband providers -- are developing the innovation lab concept. As for growing their digital capabilities, local NPR stations are generally slow to adopt new digital practices or seek new media partnerships -- even though these leverage capacity and efficiency through rather low-cost methods. A survey of public stations shows a minority of them employing new digital techniques or sprouting local media partnerships on a frequent basis. Above: One of many charts produced by the author from a survey on new media trends in public radio. This shows the rarity of partnerships between public radio newsrooms and local news websites. Source: PRNDI/MVM Consulting 2010. In late 2006, NPR worked with member station KPBS in San Diego to launch a local “innovation laboratory” to help the station accelerate its journalism in new media. The “Jacobs Project for Reporting Excellence” (or, as we called it, the Jacobs Lab) was designed and managed by this author as a convergent newsroom – an adjunct to the main newsroom – where selected “fellows” would be based for a year and taught to report news through innovative methods. 1. Innovation/Experimentation: Let creativity lead to new products, new concepts, new story forms. 2. Individual Multi-Media Skills: Advance the abilities of the journalist to work on multiple platforms. 3. Station Convergence: Provide solutions and guidance to help our organization change. 4. Community Engagement: Open doors to public participation and deeper local service. 5. Global Learning Lab: Import and export the best training, from inside and outside the industry. 6. Evolution: Show progression in benchmarks of success. Chart change in standards and practices. Write “the textbook” on new media. The project was housed in a converted conference room (a “mini-newsroom”) and had a “core curriculum” that all Jacobs Fellows would be expected to master. Above Right: The Jacobs Lab at KPBS in 2007. It may look like an ordinary office but it was a specially-designed "creative space" for training journalists in new ways of working. Below: The first Jacobs Fellows at KPBS, Andrew Phelps and Nicole Lozare. The lab fostered both creativity and productivity in new media technology. At first it was administered by the station news director (this author). Later, the position of “convergence editor” was created (staffed by Leng Caloh) and based in the laboratory. The lab instigated excitement and knowledge around multi-media content at KPBS. The Jacobs Fellows invited all KPBS employees to visit and share ideas. The fellows created a daily rundown of local content and established a journalism blog. And, of course, they covered stories for radio, television and the website. 1. Stories. The overall quantity and quality of multi-media journalism content. 2. Creativity. The quantity and quality of new products and concepts. 3. Civic Engagement: The quantity and quality of user-generated content, citizen feedback, public contacts, and new audiences served. 4. Individual Skills: Fellow success in mastering the curriculum. 5. Station Change: Quantity and quality of staff interactions, and change in staff attitudes toward convergence progress. 6. Evolution: Annual summary of “lessons learned,” organized by project planks. "I was revived as a journalist and I felt I was working for an organization that was investing in me... I was now a Journalist 2.0"
The Jacobs Project succeeded on all these goals. In fact, the change at KPBS was so swift and so widespread, that practically everything the station does today is under a "coverged" news mindset. And not just a mindset. Today, KPBS has remodeled the interior of its building to accommodate one large converged content center. Its managers insist all content staff be multi-platform capable. KPBS even hired a director of news and editorial strategy to provide journalistic leadership over all content platforms. At the end of the initial five year Jacobs project, Station Manager Deanna Mackey said the laboratory would continue (with some modifications to the fellowship structure). "With access to the Innovation Lab, I was revived as a journalist and I felt I was working for an organization that was investing in me. My employer didn’t want to just toss me out for a younger and more tech-savvy journalist. Instead, they wanted my journalism experience and they wanted to upgrade me. I was now a Journalist 2.0." What KPBS and NPR created in San Diego can be applied almost anywhere. This paper proposes a series of site-based innovation laboratories, customized to the needs of individual stations, patterned on the general model used in San Diego. The creation of an actual physical space and a safe psychological space where change is encouraged and rewarded. The investment in a technological learning laboratory where people (staff – but maybe others) can discover new tools and learn new skills. The broadening into design thinking… to work on problems… to build prototypes… to incubate new – and disruptive -- public media products or services that could be the keys to future success. The boosting of public journalism by advancing journalism through greater listening, involvement, engagement and curation of community information. The acceleration of collaboration and organizational change by enjoining all staff in the process. And the building of communication bridges to other innovation labs… to the world of technologists… academics… media partners… any potential co-innovator on the digital journey. 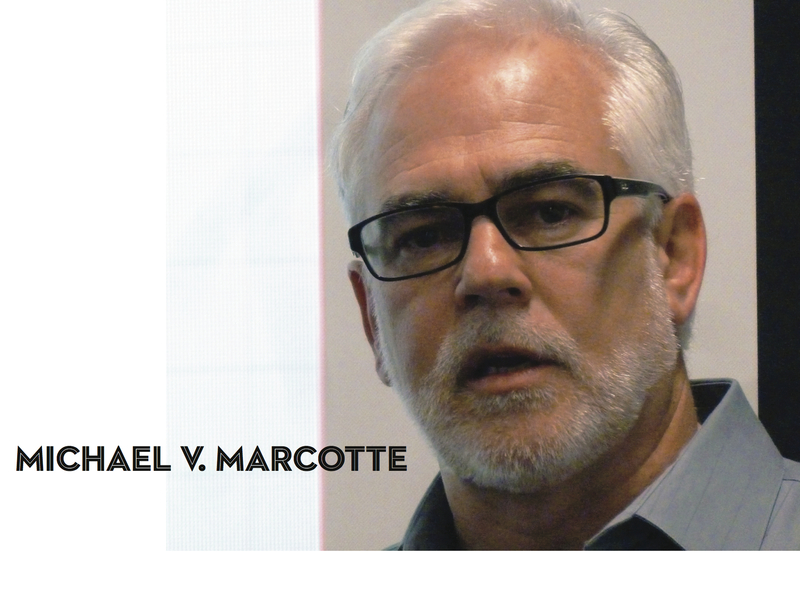 Above: Click on image to see 3-min presentation by Michael Marcotte describing his "innovation labs" proposal to the "Re-engineering Journalism" event at Stanford in May 2011. Innovation in Practice: What Does the Lab Do? Even with the common goals above, the innovation laboratory is a highly bendable concept. Its true value would be expressed in any number of ways it advances public service journalism in local communities. To imagine this more concretely, one might consider the innovation laboratory as it serves the news creation and distribution process. Consider how the lab might complement the three traditional phases of news production: gathering, producing and publishing. During the listening and gathering phase that precedes news production. The lab may house a social media editor to lead a community engagement program… to delegate responses and inquiries appropriately… to build up a social media database. The lab may deploy and manage a social engagement platform for issue oriented conversations (i.e., Facebook, blogs or website). The lab may host regular issue-oriented events (with food and drink perhaps) for in-person interaction and expert-level dialogue. The lab may run some sort of opinion poll or community deliberation process. During the news assembly phase in which journalists package what is true and relevant. It could monitor social networks in order to curate citizen media “coverage” of timely developments. It might advocate for users and challenge editors and reporters to deliver on the daily mantra: “as a listener, why should I trust this story?” Setting the bar high on veracity, courage and originality. The lab may help pioneer metrics to gauge user trust – a la “News Trust” or other on-line story rating widgets and analytic dashboards. The lab may also be the open window into the newsroom -- through which users can see what journalists are working on, how they work, and why they do what you do. Perhaps literally allowing physical access… or virtual access… or by explaining the work on air and on line as part of the reporting process. During the distribution phase when stations deliver stories for consumption, reaction and follow-up. The lab may champion the value added content to broadcast stories -- providing easily shareable story objects, such as audio clips, photos, highlighted quotes, maps, graphics, charts, videos, slideshows. The lab might simply help radio reporters convert broadcast scripts to proper text stories on-line. The lab would advocate and teach ways to optimize the user experience of local news on various platforms (i.e., make it fast and live and frequent on radio; visual and findable on-line; simple and easy on mobile; visually rich and interactive on the iPad, etc.). The lab may be the primary vehicle for station exploitation of the new “Public Media Platform” – a project by which stations would share an API (Application Programming Interface). Give users an “ombudsperson” to receive questions and complaints arising from publication. Provide newsroom continuity between the publication of a story and its reverberations and permutations in the public sphere – so that such monitoring creates a virtuous cycle of follow-up coverage based on community reactions or progressions. And the lab could be the vehicle for analytics by which the station learns and adjusts to usage patterns. These are just some of the ways the lab could be a key component in any station’s digital strategy and tactics. Different stations would have different needs and priorities. And by “linking the learning” -- sharing experiences among innovation labs – one may choose to iterate upon another’s success or failure. Innovation laboratories should have strong ties to newsrooms – but don’t necessarily have to be under the control of the news director or any other director. They should be seen as a shared resource. The natural tension within the innovation lab will be the tendency on one hand to pull its resources into the daily delivery of news and information, while on the other hand it is trying to make time for learning, for convening discussions, for experimentation, etc. In this environment, strong leadership is needed to balance these tensions and guide the lab’s mission so it can meet both imperatives (news AND innovation). This suggests some level of accountability by upper management. At KPBS it was held by an advisory council. Perhaps the most important NEW role to be created in connection with the innovation lab is the “Convergence Editor.” This editor has primary responsibility for all lab operations. The core competencies of the Convergence Editor will be a) strong journalistic judgment, b) skills in technical training, c) skills in new media (perhaps in web development or programming), and d) adeptness at communication and diplomacy. The larger the station, the larger the lab might be. In those cases other roles may be desired, such as a lab assistant or a technologist or another editor. The users of the lab would be anybody granted access according to a chosen schema. It’s assumed that news staff would have some priority, perhaps rotating through on an established schedule. This proposal envisions a national, $10.5-million, 7-year project with appropriate governance and management. A national advisory board (or board of directors depending on the organizational model) would embody the spirit and mission of the project, setting policy, appointing a national director, and helping to raise necessary funding. Aim for scaling to 30 "high potential" stations over a five-year time frame. The 30 stations would be those meeting criteria such as news budgets over $250K/year, news staffing capacity greater than 5 full-time journalists, producing at least one hour of local radio news and public affairs per week, and currently thriving in the top 20-50 markets. (This segmentation assumes that the most well-resourced stations -- in markets 1-10 -- are already meeting their journalistic/innovation potential and would not need this development program.) These are suggested guidelines and should not preclude smaller stations demonstrating the will to innovate. This phase-in process might start with 4 stations in the first year, add 5 more in the second year, 6 in the third year, 7 in the fourth year, and 8 in the fifth year. Depending on funding, the program would seek station self-sufficiency in no less than three years. Initial funding of $150K/year would provide lab build-out, convergence editor and training program. Subsequent year funding would not be less than $100K for year two, and $50K for year three. The national project admin and support costs would be capped at $250K/year for 7 years (Seven years is needed to allow the fifth year stations their two additional years of support). Project monitoring would either conclude or be extended after the seventh year. There are many potential stakeholders in this project and all should be considered for the benefits they can bring to it. NPR, for example, has a large stake in promoting competence in news and technology at member stations. CPB, likewise, would seem to support faster innovation for the sake of community public service. National organizations such as PRNDI, PRPD and DEI could help develop the concept and promote implementation strategies. The list widens dramatically outside of public media circles, too. Other stakeholders include foundation funders, academics, technology providers, and civil society groups. The national project director would be the primary leader of the effort, advocating for implementation, guiding the selection of stations, and overseeing grant funds for stations. Some support staff or contractors will be needed to facilitate the processes of station selection, laboratory implementation, training, site monitoring and compliance, and ongoing inter-site communication. This paper proposes the establishment of innovation laboratories at local NPR stations to drive organizational change and adaptation of new skills, new technology and new methods. This change is needed quickly to advance the public service missions of local newsrooms at a time when leading observers are calling for the enlarged role of public media stations in serving the information needs of local communities. These innovation laboratories would be modeled after the Jacobs Lab at KPBS in San Diego. That lab was designed and managed by this author beginning in 2006. The seven-year, $10.5-million project would seek to enroll some 30 stations as partners. Each station would hire a convergence editor and have three years to become self-sustaining. The implementation strategy next involves consultation among key constituencies. I suppose it was the early 1990s when I first truly considered my degree of commitment to local news at NPR stations. At the time, I was busy managing a growing newsroom at KPLU (Seattle-Tacoma). This was my second NPR station news job in ten years and I remember getting a call from an NPR manager asking about my interest in helping the national desk in DC. My hesitant but ultimate choice NOT to go was quite consequential and never regrettable. Although the decision then was bound up with my raising a family, it led to an ever deepening commitment to public radio news at the local level. If I was going to justify the choice, what I did from that point forward needed to be equally as important and challenging and robust as what I might have done at NPR. This drive played out via my involvement with PRNDI (Public Radio News Directors, Inc), my move to San Diego to help KPBS grow its professional journalism, and later in my solo training and consulting for local NPR stations. In a way, I ultimately served NPR too by working from the outside in. This commitment to the local side of NPR is the heart of this proposal. The ideas coalesced during my project (“Rewriting the NPR News Station Playbook”) while a Knight Fellow at Stanford University. The fellowship helped me see that after 30 years of effort trying to make local radio news good enough (important, timely, trusted and interesting enough) to merit not just listener time but listener dollars -- I am more excited than ever by the prospects of local public service media today. But we’ll need to reorganize our work, our newsrooms and most of all our thinking to meet the new challenges. The sheer technological opportunities to connect with communities, to allow greater participation in the news process, to serve more people via new channels, and to enhance our audio with visual and interactive dimensions have – yes -- made for challenges and new competitors, but more importantly promise deeper levels of learning, engagement and service. * Planning for IRE/AAJA criminal justice journalism partnership. * Fundraising and editorial planning for year three expansion of People, Power & Democracy project covering NM state legislature with KUNM, KNME, NM In Depth. * The Third Annual PRNDI News Manager Training and Certification Workshop, June 20-21, St Louis. * Hosting SPJ Regional Conference at UNM in Albuquerque. Moderator: Challenges for student media today. * Reviewer, national election grant proposal, Corporation for Public Broadcasting. * Teaching Advanced Multimedia Reporting at University of New Mexico. * Consulting with Indiana Public Broadcasting Stations to implement CPB-funded Regional Journalism Center. * Helping launch "People, Power & Democracy Project," an accountability-journalism consortium covering NM State Legislature. * 2016 Fellowship, Scripps Howard Journalism Entrepreneurship Institute at ASU Cronkite School, Phoenix. * Reviewer, grant proposal, Corporation for Public Broadcasting. * Moderator, "Native Advertising," PRNDI Conference 2015, Salt Lake City. * Co-Presenter, "Community Storytelling," National Federation for Community Broadcasters Regional Summit, Albuquerque. * A Regional Journalism Center proposal to the Corporation for Public Broadcasting on behalf of Indiana Public Broadcasting Stations. An 8-month consultancy entitled, "News Across All Platforms." * Presentation at Broadcast Educators Association conference, Las Vegas, April 2015, "From Liftoff to Orbit: The First Year of the New Mexico News Port." * Presentation at Online News Association conference, Chicago, September 2014, "Hack Your Curriculum"
* Presentation at Association for Education in Journalism and Mass Communication conference, Montreal, August 2014, "Hack Your Curriculum: Collaborate with Local Media on Your Journalism Project"
* Managing editor of the Generation Justice / Next Generation Radio multimedia journalism bootcamp. * Presentation/Workshop at New Mexico Broadcasters Association annual conference, Albuquerque, June 2014, "Leveraging University Partnerships to Expand News Coverage." * Presentation at Broadcast Education Association Conference, April 2014 -- Network analysis of digital influencers (data from MVM/UNR/USC Survey of Local Public Media Newsrooms) with Sandra Evans of USC. * Search Committee for Nevada Media Alliance Coordinator at University of Nevada. * Teaching Intermediate Reporting at the University of New Mexico, Fall 2013. * Advisor to J-Lab on "News Chops:, Beefing Up Journalism in Local Public Broadcasting"
* Advising Arabella Advisors on philanthropic opportunities in local public media. * Marketing and Business Planning for Indie-Edit, a premium editing service for public radio journalists. * News Director Recruitment for KERA, North Texas Public Media, Dallas. * Ethics Presentation, "Public Media Ethics Never Log Off," at PRNDI Conference, Houston, June 2012. * Rapporteur for the Public Media Integrity meeting in Madison, WI. * A Proposal with J-Lab to Evaluate 7 U.S. "Local Journalism Centers" for the Corporation for Public Broadcasting. * A Knight Journalism Fellowship at Stanford University. Project Focus: "Rewriting the NPR News Station Playbook." September 2010-June 2011. *Presenting to The Media Coalition, "Innovation Labs in Public Media News," May 2011. *Presenter, Palo Alto Rotary Club, "Changing Face of NPR News," April 2011. *Judging awards for Public Radio News Directors, Winter 2011. *Facilitating a "Digital Strategy Retreat" for Capital Public Radio in Sacramento, March 2011. * Roundtable Presenter for Aspen Institute on "Rethinking Public Media: More Local, More Inclusive, More Interactive," December 2010. * Facilitator for Editors Retreat, KQED, San Francisco. November 2010. * Critique Panel, Aspen Institute, White Paper on Public Media, Summer 2010. * Content Track Planning for IMA's 2009 Public Media Conference in Atlanta. Session Title: "The New News Model"